Paul Pierce to the NBA Hall of Fame? - No question! None at all! Paul Pierce just can't catch a break lately. First of all, Isaiah Thomas orchestrates his own Celtics tribute and schedules it for the same night as Paul's #34 retirement. The fact that The Captain quietly protested the dual tribute tells me a change needs to be made. Now there is negative noise from the West Coast about Pierce's eligibility for the NBA Hall of Fame. Paul can't even be considered for 2-to-3 years, so isn't this an early start for the naysayers? Pierce was drafted 10th in the 1998 NBA draft, and there were a number of NBA executives that regretted bypassing him. Michael Olowokandi was the first overall pick and one of the biggest draft blunders of all time. Mike Bibby, Raef LaFrentz, Antawn Jamison, Vince Carter, Robert Traylor, Jason Williams, Larry Hughes and Dirk Nowitzki followed and all went before Pierce. Paul had a chip on his shoulder after that and would yell out the names of those chosen before him at each practice shot. Mercury is an insidious neurotoxin, and according to the WorldMercuryProject, can "severely disrupt the normal neurodevelopmental processes in the human brain". In other words, it makes you crazy and stupid. It appears that is what has occurred in California, at least to a few individuals. Imagine the Celtics team pre-Kevin Garnett/Ray Allen without Pierce. 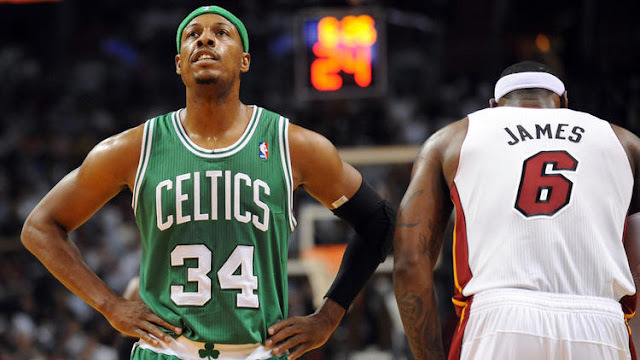 What if Boston had taken Bonzi Wells (taken at #11 after Pierce) at the 10th pick? The Truth needs some true respect, and it isn't happening. So I will finish this article with a "super" tribute to The Captain by a beloved former teammate of Paul's, the ever-unpredictable Kevin Garnett. The video is absolutely charming and shows the two stars after a tough game against the Toronto Raptors. I wouldn't doubt we will see Kevin in Springfield with Paul in a few years.